The linguistic and thematic distribution of the letters is very interesting. Vámbéry was on correspondence with his student since the 1860s, and the language of these letters was almost exclusively German 7 as long as 1894. 27 letters have survived from this period, and this series was broken only by two letters in Hungarian and one in English. 8 However, in 1894 this proportion changed on the contrary. 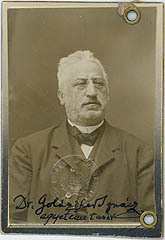 While the letters dated to the early months of the year were written in German, in June Vámbéry already proposed his “private secretary” to the attention of Goldziher in Hungarian. 9 From then on – with four exceptions – he only wrote in Hungarian, a total of 37 letters. Goldziher, as he writes in his Diary, saw this proposal for the first time on the table of the Dean, and he was very upset by it. “This is where I got in the 26th year of my university career? A supplication instead of a clear recognition? And in addition, the expectable failure.” 37 However, at that time he still thought to let the things flow on their own way. But on the same day he also visited Vámbéry, who mentioned him the application, and as a result, in the night of 1 May he wrote a long letter to his former professor, asking him to withdraw the submission. 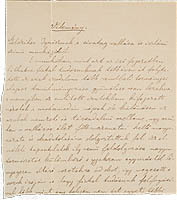 Vámbéry, having carefully considered Goldziher’s words, first decided to present the application to the Faculty if it will be accepted “without debate and contrary vote”. However, in his second letter he writes that during his informal interviews he learned that the debate would be inevitable, thus he withdrew his proposal, but he did not give up supporting Goldziher’s advance. “I will speak with the minister, and I hope that he will fulfill my wish by his own will” –, he closes his letter.